2018 is a big year for the Brooklyn Music School! We are celebrating the centennial of being on Saint Felix Street. Our historic home continues to serve as the place where children, parents, and the community come together to celebrate the joys of music. Please join us as we celebrate all things BMS on Thursday, October 25, 2018, at the DUMBO Loft. 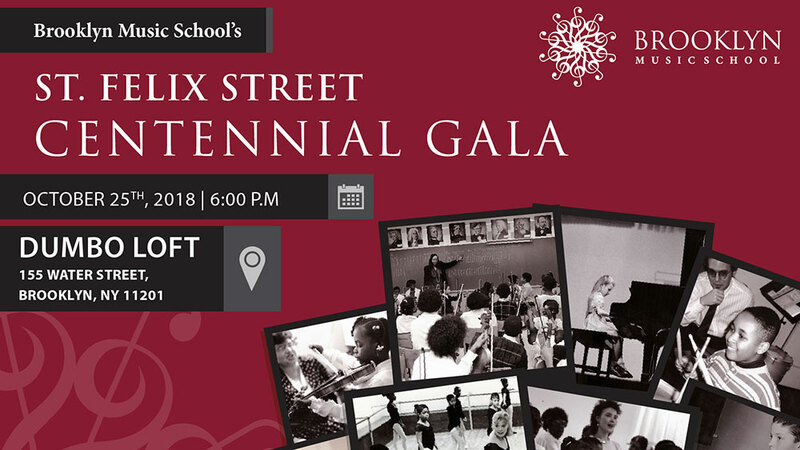 This year’s gala will feature performances by students, faculty, and will celebrate the rich history of the Brooklyn Music School on Saint Felix Street. Moreover, we are delighted to honor multi-Grammy award-winning Jazz artist Arturo O’Farrill for his continued commitment to community music schools and enriching the community with the performing arts. If you’d like to help with the planning of this event, please email us at gala18@brooklynmusicschool.org and our team will get in touch with you. We are seeking people to help with silent auction items. If you know of anyone or would like to donate something, please email us! Thank you for your continued support of the Brooklyn Music School. I hope to see you in October as we celebrate all things BMS!